Large home with 5 bedrooms and open floor plan. A perfect get-a-way for families and friends. Located in the center of the state, so all the fun Colorado has to offer is just minutes away. This home has a large, modern kitchen, a big laundry room with new appliances, lots of comfy spots to relax and spend time together. Satellite TV on large screen and plenty of comfortable seating. Open floor plan with kitchen island allows everyone to enjoy common space. Large bedrooms allows you privacy when you need it. Three full bathrooms and 5 bedrooms means everyone can sleep comfortably. Two bedrooms have king beds, two have queen beds, one has 4 twin beds (two sets of bunks) and there is a fold out couch. At nearly 9000 feet above sea level, the evenings are always cool enough for a fire in the fire-pit. A pellet style wood stove supplements the heat in the house. The home is pet friendly, but be sure your pet is well trained. Deer, foxes, squirrels, chipmunks and other wildlife are frequently seen in the yard. One pet per visit, and pets must be crated while unattended. Will you be spending time at TihsreeD Lodge? We are less than a mile away! 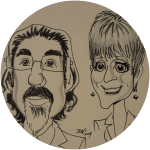 About Toni and Don Moore Toni and Don always dreamed of entering the lodging business and in 2010 decided to go for it. They have had a wonderful time sharing TihsreeD (Tiz-reed) and meeting lovely people from all over the world. They enjoy helping their guests plan a Colorado adventure. Their goal is to ensure that your time at TihsreeD is memorable and that you will want to return. Toni is a chemist, teacher, and artist. She enjoys making the Lodge look special and is always available to assist you with your stay. Don is financial services consultant and the general handy man for the Lodge. Both Toni and Don are marathon runners, skiers, and cyclists. They stay fit tending to the 50 private acres that make up TihsreeD. Fire mitigation, tending to the trails, and landscaping at 9000 ft. above sea level is quite a workout. Their goal is to make all of TihsreeD a park like setting in the mountains. Toni and Do Moore purchased The Lodge in 2006, and added The Cabin in 2015. Why Toni and Don Moore chose South Central Colorado TihsreeD (Tiz-reed) is a truly magical place. 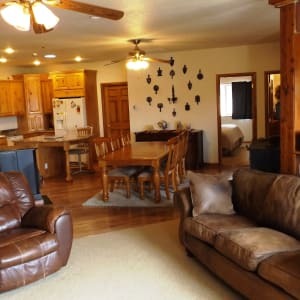 We are sited in the center of the state so you have just a short drive to the best Colorado has to offer and if you choose to stay put, we have plenty of fun for you on site: a golf tee, hiking trails, hot tub, dvds, fireplaces, wildlife and much more. TihsreeD is built on the historic Ute Native American vision quest trail. Many of our trees were culturally modified over hundreds of years by the Ute warriors as they made prayers, held ceremonies and completed their vision quests. When you visit, we believe you will agree that our property feels holy. What makes our venue unique TihsreeD (Tiz-reed) is decorated with fun and whimsical items, many for sale. There are games, collectibles, antiques and tchotchke that you will enjoy. Many guests choose to purchase items to take home as mementos of their Colorado vacation. The venue is located at 9000 feet above sea level, so a hike on the property will give you an extra effort work out. There are swings along the path and many deer, turkey, foxes, and more on the property. The views of Pikes Peak and the Collegiate Mountains are beautiful. It is uncommon to find a spot so private, yet with so much space. Large groups can enjoy the time together, yet have room to rest and reflect. There is something magical about being away from the hustle and bustle of daily life and having time to really build relationships. Our guests leave with a real Colorado experience: wonderful mountain air, water and views. Guests go home with a Rocky Mountain high in their head and their hearts. Call us at 719-839-0860 or email us at tihsreed@gmail.com. To contact guests in The Lodge, call 719-748-1143. 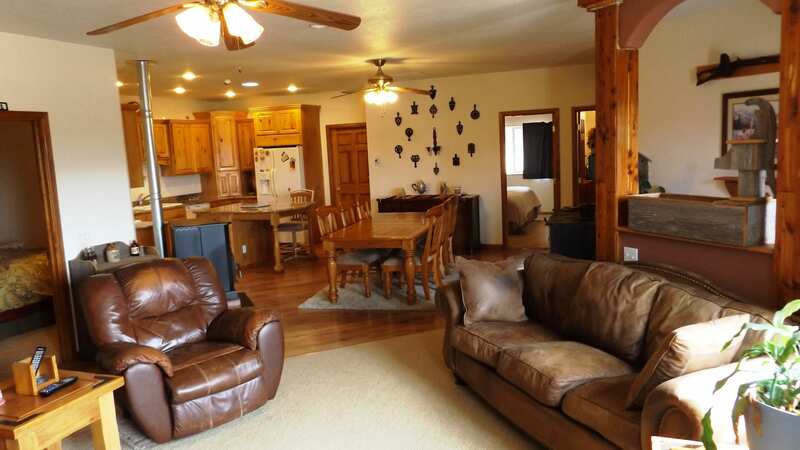 To call guests in The Cabin, call 719-748-6025.